Meanwhile Casey had the wake up time of 7:00am. He had a shuttle ride at 7:30 to get to the bivouac and do his final preparations before go time. 8:36am was Casey’s start time, he had a 247km liaison before the start of the special. The special was a 84 km long loop that started and finished at tonights bivouac. Once we arrived at the bivouac, the crew got to work quickly to setup the bivouac before Casey arrived, ready to make any last minute changes to the vehicle before the special. Pisco bivouac being set up. Casey’s Monster Energy Can-Am Maverick X3 looking clean for stage 1. Climbing the first dune right off the start. Casey started 4th in the SxS class, taking a safe approach, he finished 6th on the day, 4 minutes and 55 seconds off the leader. The stage included peaky dunes with tricky witch eyes and a long windy riverbed with tire size rocks that could’ve added an extra 5 minutes of time if you were to get a flat. Casey carving around a group of fans. 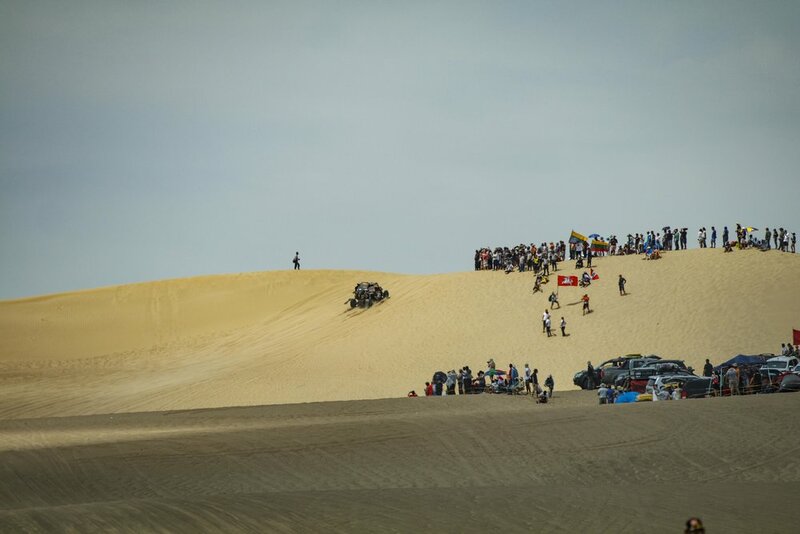 Thousands of fans packed the sides of the dunes cheering as every vehicle passed by. Fellow American and Monster Energy teammate Ricky Brabec finished 3rd on the day. The finish of the car class was a drag race complete with helicopter in tow. Being our first night in the race bivouac we headed up to get food. When we found out we would be coming to Dakar a lot of people warned us about how unappealing the bivouac food is. So the walk to dinner was a little bit nerve racking. Tonight’s meal was a 1/2 grilled chicken with vegetables, pasta, mushroom salad, and a delicious caramel pudding for dessert. It was a pleasant surprise to all the warning tales we’ve received. 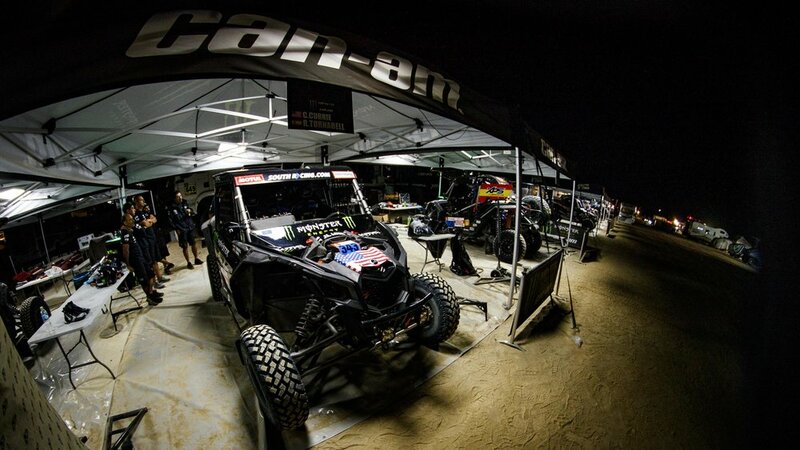 After dinner, the crews were back to work putting the final touches to Can-Ams for stage 2 tomorrow. Another new experience was the sleeping arrangements in the bivouac. Most of the racers will stay in hotels in town or rvs at the bivouac to get as much rest as possible before the long days of racing. On the other side of the spectrum the crews opt for a quicker route to bed. Tents are set up right at each pit, so as soon as the work is done late at night they can quickly get to bed and get as much sleep as possible. Our tents lined up right behind one of the parts trucks. Stage 2 will be from Pisco to San Juan De Marcona. It starts with a short 7 km liaison to a long 342 km special and finishes with a 203 km liaison. The stage also is the only stage where the cars and SxS will open the rally in front of the bikes. Co-Pilots will now have difficulty navigating without the help of the moto tracks in the dirt.